A winter-themed gift basket works well for a number of gift-giving situations. The contents of each gift basket option are easy to modify to fit the specific style of the recipient. Even the container that holds the gift is flexible. Whether you need a gift for a winter birthday, shower, fundraiser or just to say hello, a winter gift basket is a good option. Winter driving is hazardous in climates with ice and snow. A homemade car safety kit is a good option for a gift basket. While you can present the items in an actual basket, a zippered tote bag or plastic tote box with a lid is a better option. The entire gift can go directly in the car with all of the contents safely inside the container. Content ideas include jumper cables, emergency blankets, energy bars, sand for traction, tools, gloves, water, flashlights, a reflective triangle and a first-aid kit. A basket full of winter treats works well for any recipient. 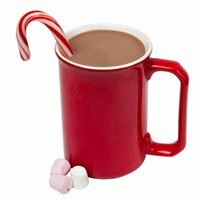 Hot cocoa, gourmet coffee or holiday tea is a common staple in this type of winter gift basket. Related items such as a coffee cup, stirring spoon, coffee creamer or a teapot adds to the gift basket. Cookie dough or a cookie mix in a jar also works well. Add in a few cookie cutters and a rolling pin for extra gifts. Other food items that work well include salami, cheese, baked cookies and chocolates. A gift basket full of outdoor winter items works well for outdoor enthusiasts. This winter gift idea provides toys and tools for outdoor play. A pair of thermal underwear, gloves, snowball maker, scarves, hand warmers, boot grips or snow shoes work well. If the recipient prefers to stay inside during the cold months, a basket full of indoor winter items will keep them entertained. A cozy fleece blanket works well in the bottom of the basket. Ideas for inside the basket include slippers, scented candles, winter-scented spa treatments, robes, books, puzzles, movies and board games.